You know what a screwdriver is. 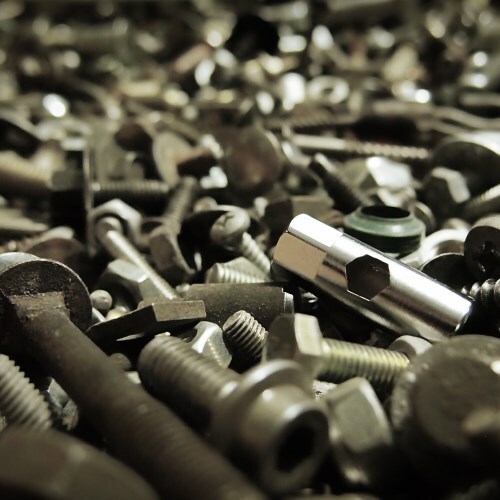 Probably you have many of them in your toolbox in different sizes together with a box containing many different screw driving bits. What you need, is the one screwdriver you can always have with you. 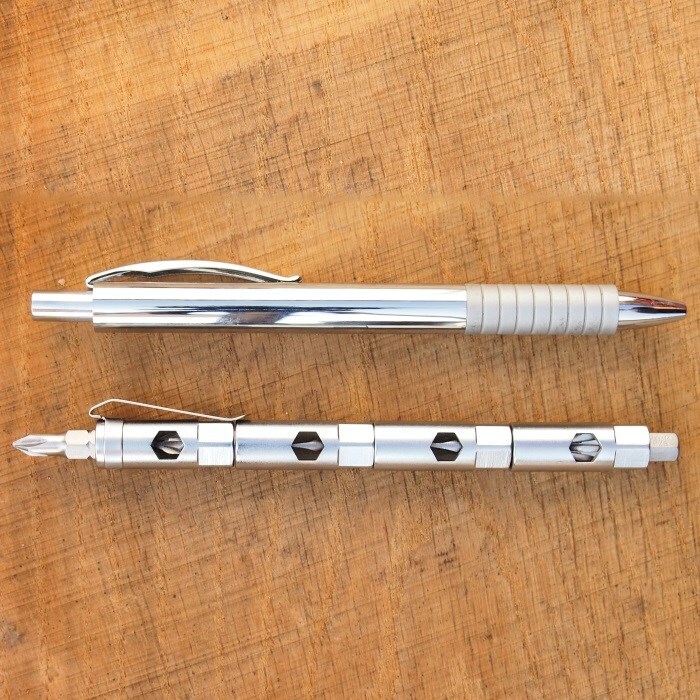 Small and lightweight to carry always with you, keeping a screwdriver bit securely with the sharp top reaching protectively inside. Offering more functions and combination possibilities than you first can think of. It is not designed to simply replace screwdrivers, it extends them. Don’t mess around with an unhandy and overloaded (and still missing the one screwdriver you really need) multi-tool. Once a part is worn or broken, it’s not replaceable. Not so for the bitky. 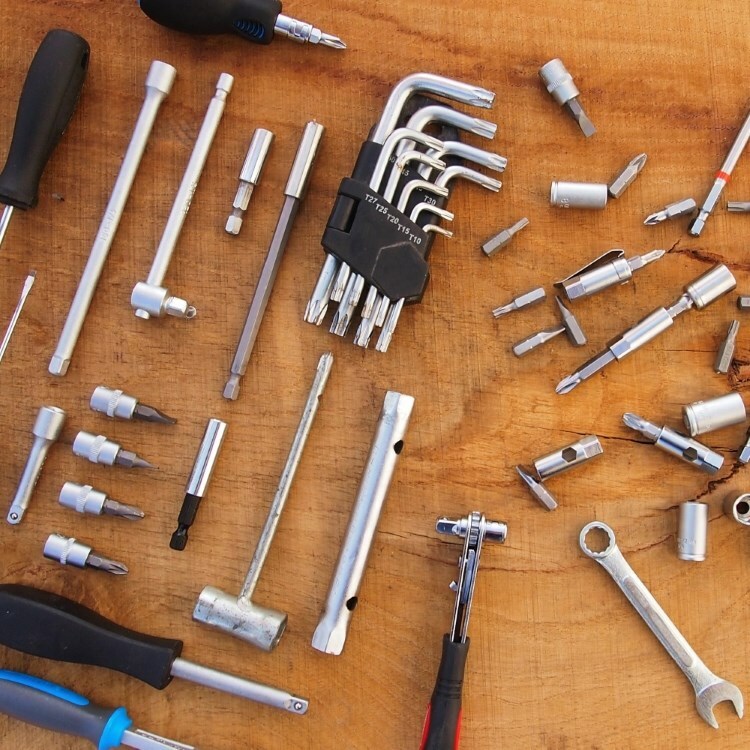 Simply use every common screwdriver bit – replaceable and on low costs. 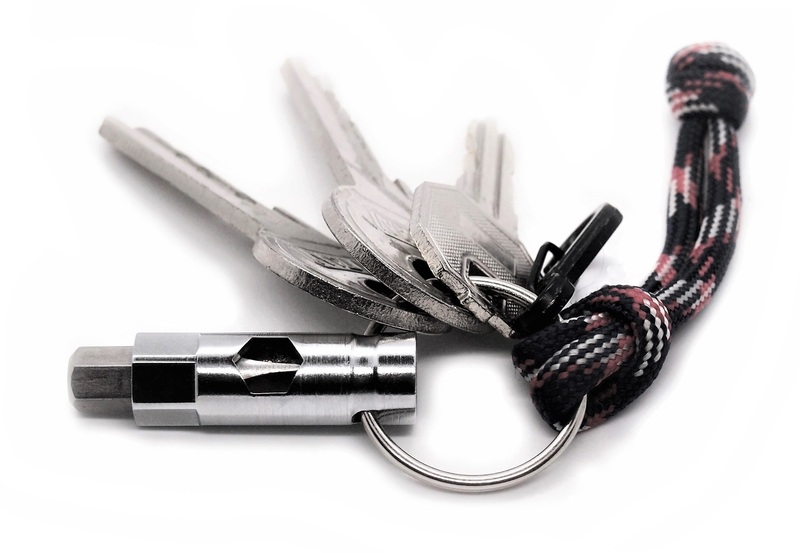 Choose the one you really need to take on your journey – no matter you go cycling, skiing, hiking, fishing, photographing, or wherever your trail takes you - and put it on your keychain, backpack, or jacket to have it always with you.. Durable designed to last long. Made of one-piece of tooling steel and with a chrome coating for protection and a sleek finish. The T-form allows high torque. And the neodymium magnet holds the bits strongly while allowing a quick release. It is important to use the right screwdriver type. Why? If you don't use the right type you easily damage the screw. It may work to get a screw in or out, but then you mostly need to screw with more force. And the good news for you is, the bitky is designed to work with (mostly) all standard screwdriver bits - that means that you don't have to buy expensive, special modeled bits with no guarantee for getting a replacement. So, think of all these possibilities which can offer you even just one bitky. And for those who prefer working with power tools - it replaces a bit holder without any limitations. Even offering different length by simply using different bit lengths. 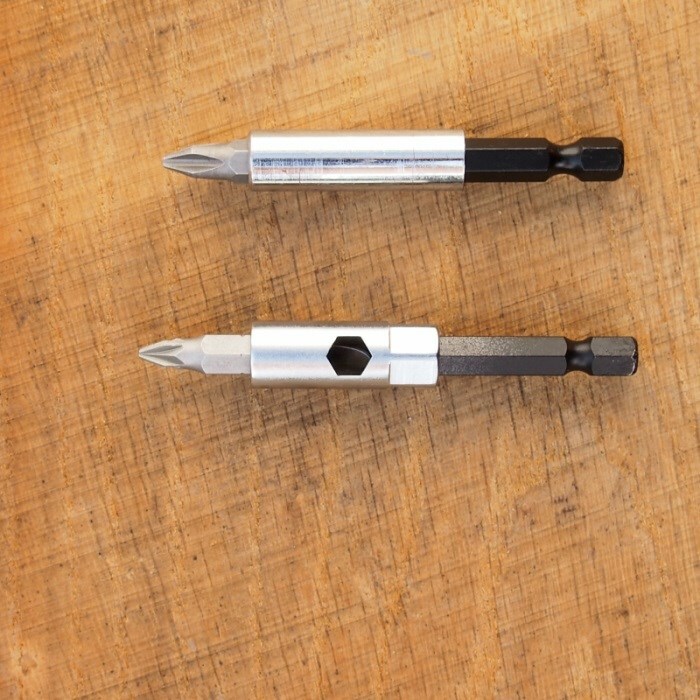 Unique design to replace the one tools and extends the other tools. The evolution of the classic bit holder. Multiple combined and still in a pen size. The T-form allows more force for manual screwing. Fitting all standard screwdriver bits. No special expensive bits needed. 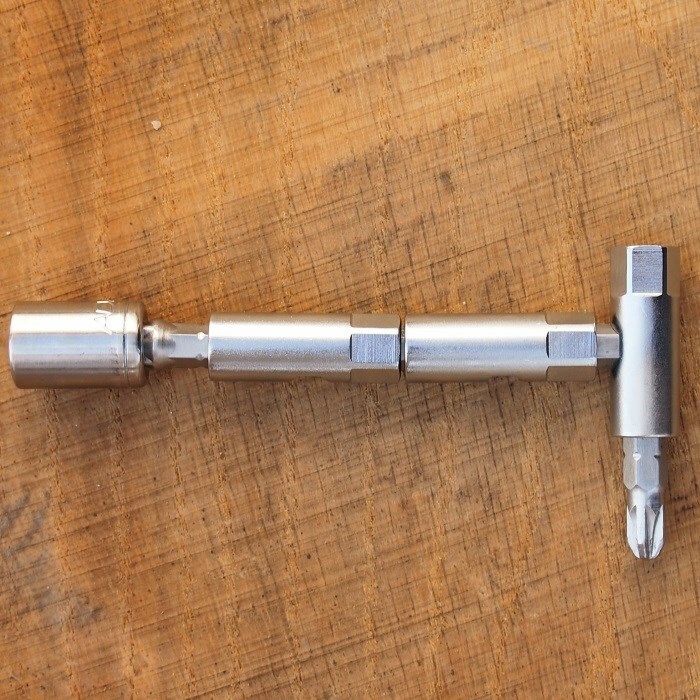 The 9 mm hex shaft offers a combination with ratchets and wrenches. Usable as a bit holder - with more possibilities. Many possibilities to jazz it up. Let your creativity run free. This new tool offers you advanced possibilities for everyday and professional use. and it is perfect for daily carrying and using. Its most important function is of course screwing. It can be used for manually screwing by hand, in combination with other hand screwing tools as ratchets or as a common bit holder for electric screwdriver. This allows him to be used by nearly everyone – from homeworkers to professional craftsmen. From both sides and sideways a bit can be inserted. When the bit is inserted sideways, the form offers more force to screw with. Combined with additional bits and bitky, a longer shaft can be formed for a bit extension or more lever force. That's actually where the name is from - bit(ex)tender. All available standard screwdriver bits (6,35mm - 1/4inch) fit into the bitky. 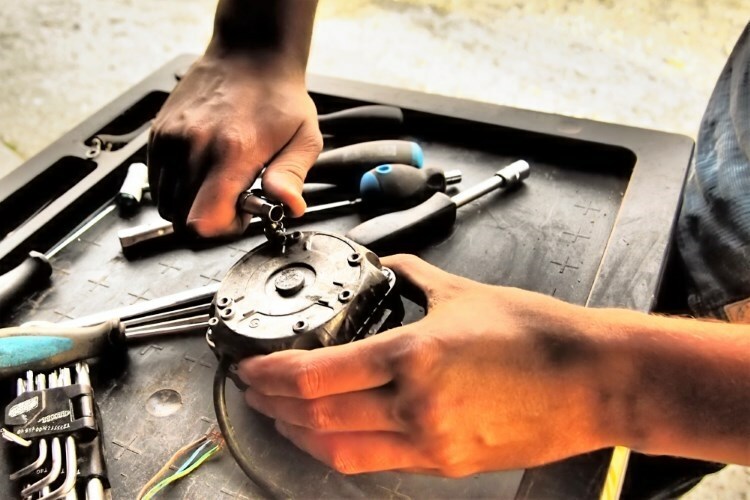 So you don't need to buy specific and expensive bits - even better, you can easily use the bits you already have in your toolbox at home. 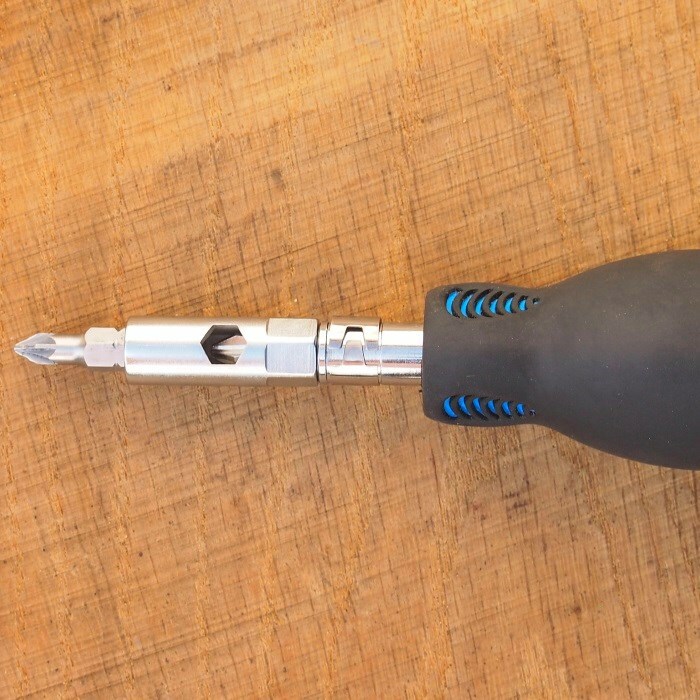 When using the bitky with an electric screwdriver, it can be fixed with an inserted bit or directly with the outer hex formed part. 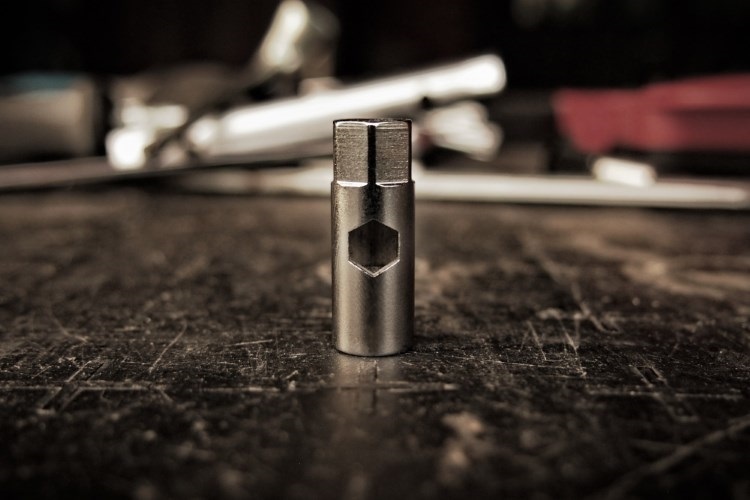 To offer even more possibilities in its use, the outside hex form with a 9 mm size offers to connect the bitky with wrenches and through a socket also with ratchets. The longer (back side) insertion even fit in a “double head” bit. So you can use also those - which by the way gives you even one more bit head on the way ;). Don’t mess around with a bunch of bits or a toolbox full of screwdrivers in different sizes and lengths. 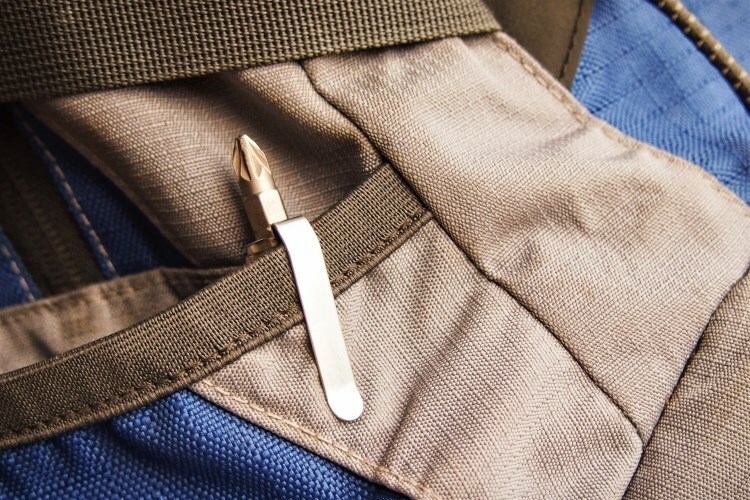 The bitky holds your bits in one place and reduces the needs of different screwdrivers. To see quickly which bits are inserted in the bitky, the side hex hole is positioned to see the front bit head. The minimal design results in the its low weight and small size. You can decide, how many bitkys and bits you combine to take on your tour. The bitky is made of steel. Therefore, it is strong enough for likely all screwing jobs you can use it for. To protect the bitky against influences like scratches and rust, it is coated with chrome! Optional you can get a carrying clip to hold the bitky save. 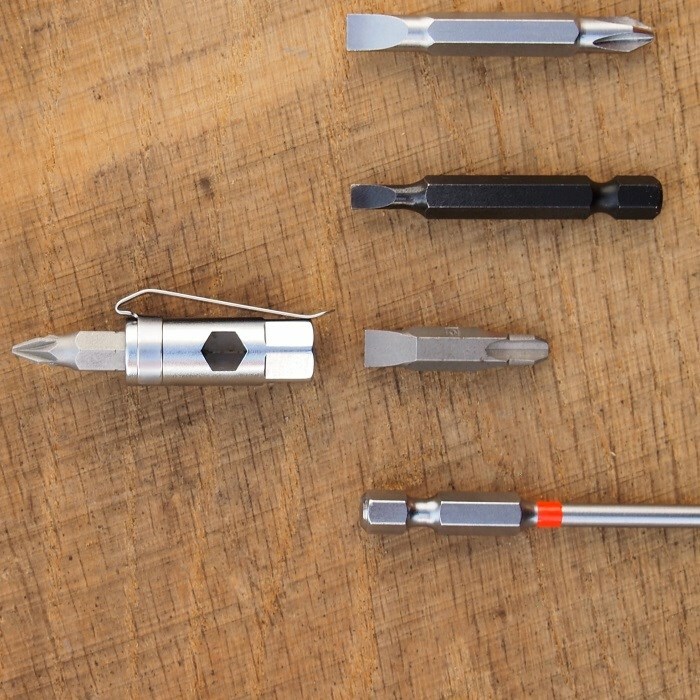 Like you are used to it from pencils, the bitky can be clipped to every different place – from clothes, bags, boxes, key-rings, notebooks, and so on. 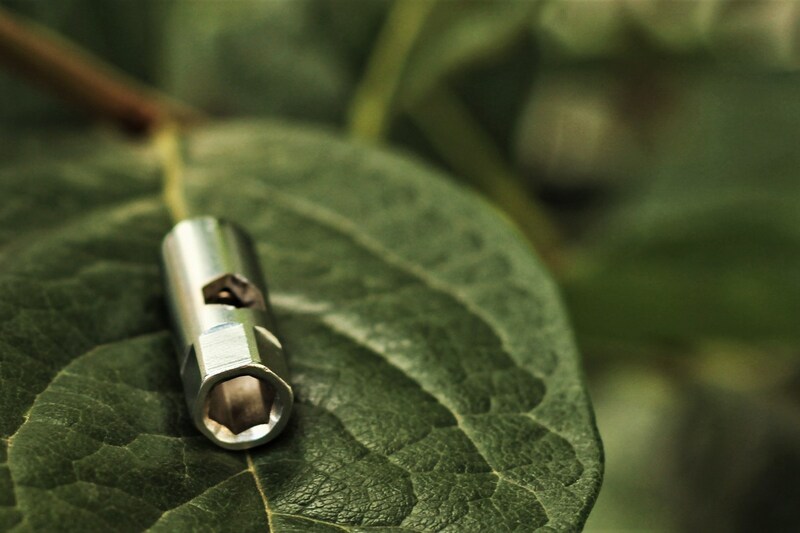 Before the bitky, bits were carried in unpractical boxes or in the handle of oversized screwdrivers – now you can have them in a pocket-sized tool for daily carrying while the tool is a multifunctional bit driver itself. Inside of a bitky is a neodymium magnet, which holds the bits at their place. As the inside magnet is positioned next to the side hex hole, it also holds the sideways inserted bit. So, it will not fall apart while carrying and using it. Why is the bitky different to other Multi-Tools? Most of the existing gears for your pocket have a bunch of different functionalities, good to have with you in an emergency case or just when you have no other tools at hand. Those who offer you a screwdriver often have fixed sizes or non-standard bits. Besides the benefits of having many tools in once, they are designed to be practical in carrying, less to be handy in their using. That’s why you probably will use “real” tools if you have them with you - doesn’t matter if you build a new shelter or just fix a broken bicycle tire. These are the reasons, why the bitky was designed to fit also into a professional working environment – with advanced possibilities and also for using it as an everyday carrying tool. AND it fits with standard bits! So no extra, no expensive, no non-replaceable bits - easily use the bits you have available. These are the reasons, why the bitky was designed to fit also into a professional working environment – also with advanced possibilities for using it as an everyday carrying tool. AND it fits with standard bits! So no extra, no expensive, no non-replaceable bits - easily use the bits you have available. "We don't want just to simply replace tools. We want to extend them and their uses." What can I do with the bitky? Which possibilities offers the bitky? The bitky offers you a huge amount of application possibilities. 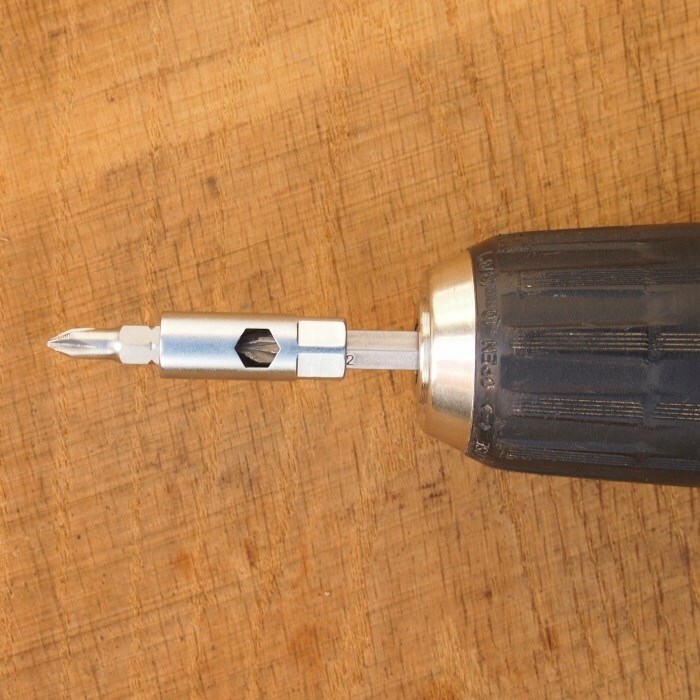 Starting from using as a common bit holder with your power tools up to combine it with more bitkys to store and carry your favorite screwdriver bits. 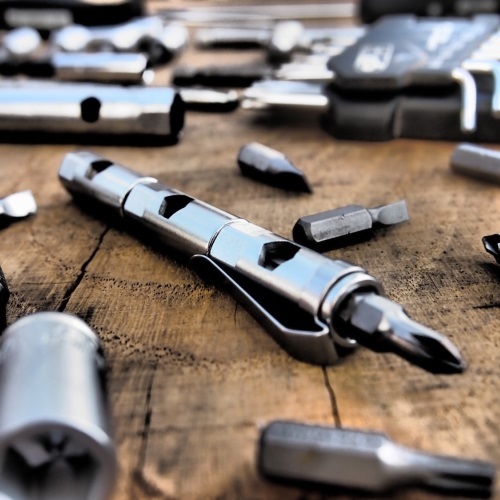 Also, you can use it in different combinations for manually screwing or in use with other common tools from your toolbox as ratchets and wrenches. 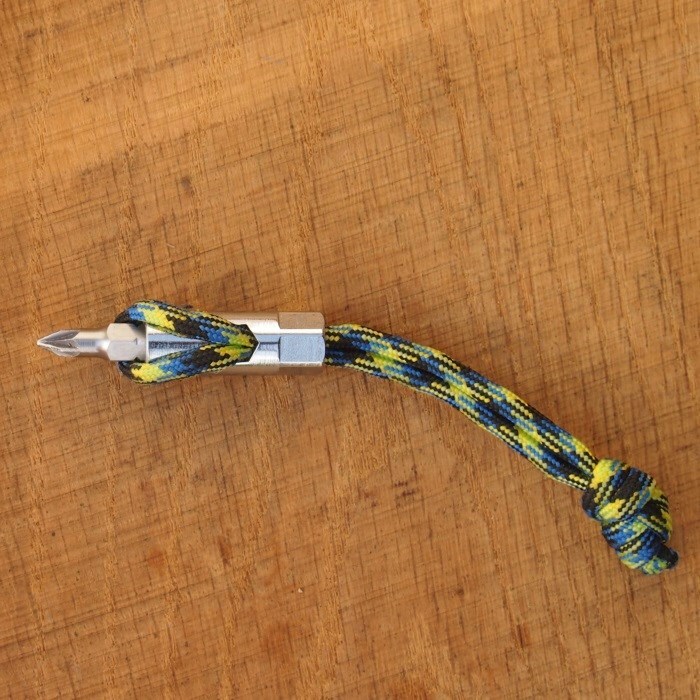 It offers you to store up to two standard bits (also one double side bit is possible to store) to carry them in your tool box or at your key chain, backpack, jacket,... Also, you can use it already for manually screwing in many cases and if you need more force, just add a long bit or a standard bit holder out of your tool box. I want to order it in a large quantity. Is this possible and how? Whether you need the bitky for your domestic Workshop, for your company or for a special business partner present – there are different reason for a large ordering quantity. Don’t hesitate to contact us and we will come back to you as soon as possible. I have two bitkys, but when I connect them with my bit, there is still a small gap between those. Is this normal? In a production, there are always tolerances and because of this, the gap is a normal result. We even developed it with a small gap, as if they wouldn't have the inserted bit may have not a complete contact to the magnet and wouldn’t hold two bitky properly together. I don't have the clip or I lost the clip. What can I do now? Shipping a new clip to you is quite cost intensive. But you are free to contact us! But we have even a better tip for you: Look at your desk or ask around for a normal pen, which often have clips like this ;) In the best case, you will find one. 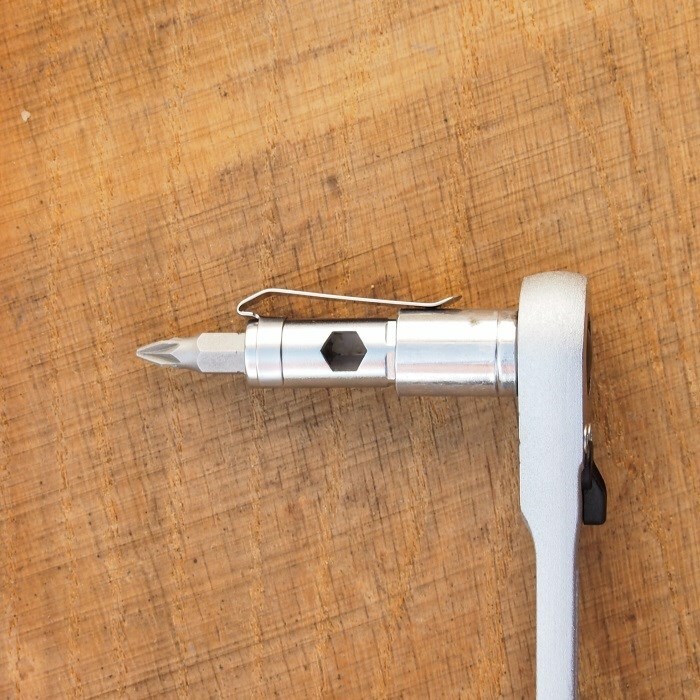 For our first prototypes, we also used a just a clip from a pen. Never use the tool in unusual cases which it is not designed for. It can result into damages and injuries. Do not use the tool in electrical environment. Never insert bits and similar in the side hole while using in combination with fast rotation, for example with electrical drills. Do not grind or weld the tool to modify their aspect. Use appropriate tools in combination with the tool of this product. Follow their instructions in addition. Choose your screwdriver bit according to the screw type and its dimensions. Never put your hands near the screw head when tightening. A screwdriver must be used as a screwdriver: Do not use it as a chisel, hammer, lever, or punch. Too much force can damage the product and can cause injuries. All users must take further protection according to their work requirements and to their country’s regulations. The product contains small pieces. Keep away from Kids. Bits can be sharp. Be careful while carrying around the tool with inserted bits. We are very delighted that you have shown interest in our enterprise. Data protection is of a particularly high priority for the management of the Jonas Henger. The use of the Internet pages of the Jonas Henger is possible without any indication of personal data; however, if a data subject wants to use special enterprise services via our website, processing of personal data could become necessary. If the processing of personal data is necessary and there is no statutory basis for such processing, we generally obtain consent from the data subject. The processing of personal data, such as the name, address, e-mail address, or telephone number of a data subject shall always be in line with the General Data Protection Regulation (GDPR), and in accordance with the country-specific data protection regulations applicable to the Jonas Henger. By means of this data protection declaration, our enterprise would like to inform the general public of the nature, scope, and purpose of the personal data we collect, use and process. Furthermore, data subjects are informed, by means of this data protection declaration, of the rights to which they are entitled. As the controller, the Jonas Henger has implemented numerous technical and organizational measures to ensure the most complete protection of personal data processed through this website. However, Internet-based data transmissions may in principle have security gaps, so absolute protection may not be guaranteed. For this reason, every data subject is free to transfer personal data to us via alternative means, e.g. by telephone. The data protection declaration of the Jonas Henger is based on the terms used by the European legislator for the adoption of the General Data Protection Regulation (GDPR). Our data protection declaration should be legible and understandable for the general public, as well as our customers and business partners. To ensure this, we would like to first explain the terminology used. The website of the Jonas Henger collects a series of general data and information when a data subject or automated system calls up the website. This general data and information are stored in the server log files. Collected may be (1) the browser types and versions used, (2) the operating system used by the accessing system, (3) the website from which an accessing system reaches our website (so-called referrers), (4) the sub-websites, (5) the date and time of access to the Internet site, (6) an Internet protocol address (IP address), (7) the Internet service provider of the accessing system, and (8) any other similar data and information that may be used in the event of attacks on our information technology systems. When using these general data and information, the Jonas Henger does not draw any conclusions about the data subject. Rather, this information is needed to (1) deliver the content of our website correctly, (2) optimize the content of our website as well as its advertisement, (3) ensure the long-term viability of our information technology systems and website technology, and (4) provide law enforcement authorities with the information necessary for criminal prosecution in case of a cyber-attack. Therefore, the Jonas Henger analyzes anonymously collected data and information statistically, with the aim of increasing the data protection and data security of our enterprise, and to ensure an optimal level of protection for the personal data we process. The anonymous data of the server log files are stored separately from all personal data provided by a data subject. The website of the Jonas Henger contains information that enables a quick electronic contact to our enterprise, as well as direct communication with us, which also includes a general address of the so-called electronic mail (e-mail address). If a data subject contacts the controller by e-mail or via a contact form, the personal data transmitted by the data subject are automatically stored. Such personal data transmitted on a voluntary basis by a data subject to the data controller are stored for the purpose of processing or contacting the data subject. There is no transfer of this personal data to third parties. If one of the aforementioned reasons applies, and a data subject wishes to request the erasure of personal data stored by the Jonas Henger, he or she may, at any time, contact any employee of the controller. An employee of Jonas Henger shall promptly ensure that the erasure request is complied with immediately. Where the controller has made personal data public and is obliged pursuant to Article 17(1) to erase the personal data, the controller, taking account of available technology and the cost of implementation, shall take reasonable steps, including technical measures, to inform other controllers processing the personal data that the data subject has requested erasure by such controllers of any links to, or copy or replication of, those personal data, as far as processing is not required. An employees of the Jonas Henger will arrange the necessary measures in individual cases. If one of the aforementioned conditions is met, and a data subject wishes to request the restriction of the processing of personal data stored by the Jonas Henger, he or she may at any time contact any employee of the controller. The employee of the Jonas Henger will arrange the restriction of the processing. In order to assert the right to data portability, the data subject may at any time contact any employee of the Jonas Henger. The Jonas Henger shall no longer process the personal data in the event of the objection, unless we can demonstrate compelling legitimate grounds for the processing which override the interests, rights and freedoms of the data subject, or for the establishment, exercise or defence of legal claims. If the Jonas Henger processes personal data for direct marketing purposes, the data subject shall have the right to object at any time to processing of personal data concerning him or her for such marketing. This applies to profiling to the extent that it is related to such direct marketing. If the data subject objects to the Jonas Henger to the processing for direct marketing purposes, the Jonas Henger will no longer process the personal data for these purposes. In addition, the data subject has the right, on grounds relating to his or her particular situation, to object to processing of personal data concerning him or her by the Jonas Henger for scientific or historical research purposes, or for statistical purposes pursuant to Article 89(1) of the GDPR, unless the processing is necessary for the performance of a task carried out for reasons of public interest. In order to exercise the right to object, the data subject may contact any employee of the Jonas Henger. In addition, the data subject is free in the context of the use of information society services, and notwithstanding Directive 2002/58/EC, to use his or her right to object by automated means using technical specifications. If the decision (1) is necessary for entering into, or the performance of, a contract between the data subject and a data controller, or (2) it is based on the data subject's explicit consent, the Jonas Henger shall implement suitable measures to safeguard the data subject's rights and freedoms and legitimate interests, at least the right to obtain human intervention on the part of the controller, to express his or her point of view and contest the decision. If the data subject wishes to exercise the rights concerning automated individual decision-making, he or she may, at any time, contact any employee of the Jonas Henger. If the data subject wishes to exercise the right to withdraw the consent, he or she may, at any time, contact any employee of the Jonas Henger. If you require any more information or have any questions about our site’s disclaimer, please feel free to contact us by email at bitky@jonashenger.info. All the information on this website is published in good faith and for general information purpose only. jonashenger.info does not make any warranties about the completeness, reliability and accuracy of this information. Any action you take upon the information you find on this website (jonashenger.info), is strictly at your own risk. jonashenger.info will not be liable for any losses and/or damages in connection with the use of our website.